Being sick, I was scrolling through Netflix and came across a little documentary called I Am Your Father. 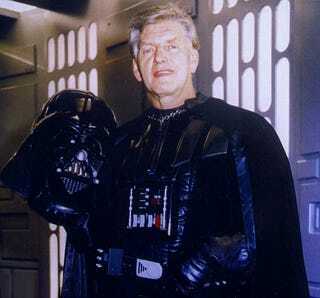 It’s about the life of actor David Prowse, centered around his involvement with Star Wars. Though kind of somber in tone, I found it worth watching. The film maker always thought Prowse got screwed by not being allowed to play Vader the moment he was unmasked, and he set about arranging a re-filming of that pivotal scene in ROTJ with Prowse in it, even though Lucasfilm denied permission for it. Some things that struck me: Prowse is actually better known in England for his public service work for street crossing safety (he was honored by the Queen). Star Wars is very important to him, and the snubbing he perceives he has had from Lucas and Lucasfilm clearly hurts him. Also, I am now convinced that he could have done Vader’s voice himself. When his ripped off the line, “You are part of the rebel alliance and a traitor!”, I was sold. Fun bit of trivia: his son James tells how after ESB came out, he was nicknamed Luke by the kids at school.